Lead by example - A great leader understands that in order to spark the confidence needed in others and in your own leadership, you have to do the tasks that you are asking others to do. Adopt a “no task too small” mindset in your career, and show the leadership at your company that you are willing to be an example for others. Make decisions - As a leader, you must make decisions, whether good or bad, and live with the consequences. In the interview process, prepare examples for when you made a decision that impacted your team, both positively and negatively, and what you learned from the situation. Be confident - Colin Powell once stated, “Leadership is solving problems. The day soldiers stop bringing you their problems is the day you have stopped leading them. They have either lost confidence that you can help, or concluded you do not care. Either case is a failure of leadership.” Have confidence in your own decisions and confidence in the experiences and skillset you gained in the military. 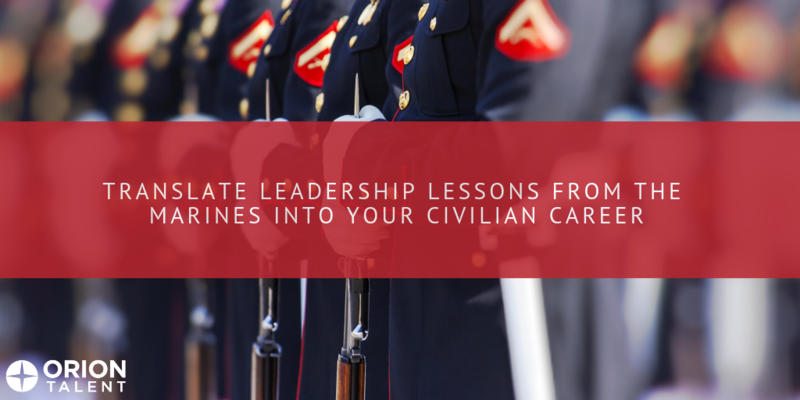 Understand that these qualities are what companies are seeking in their employees, and that the soft skills learned in the military are highly sought after in the civilian workplace. Know Your Marines - Just like it’s important to know your fellow service members, it’s also important to know your potential employer. Do your research during the interview process and find out everything there is to know about the company that you’re interviewing with, including their mission, values, culture, and history. Researching your employer will also serve you well once hired, as you will have a deeper understanding of the company. Understand the potential risk - From the article, “Before you plan to do something, make sure you understand what you’re about to get into.” Once you have made the decision to transition out of the military, make sure that you are properly prepared. Orion offers a Military Transition Resource guide to help you prepare for every aspect of your transition. Following our guidance will ensure that your transition and civilian career will be successful. While the G.I. Jobs article highlighted the Marines, every branch of the military has instilled these qualities in its service members and veterans. Here at Orion we want to help you reach your civilian career potential. Learn more about Orion’s services, and register today to get started.